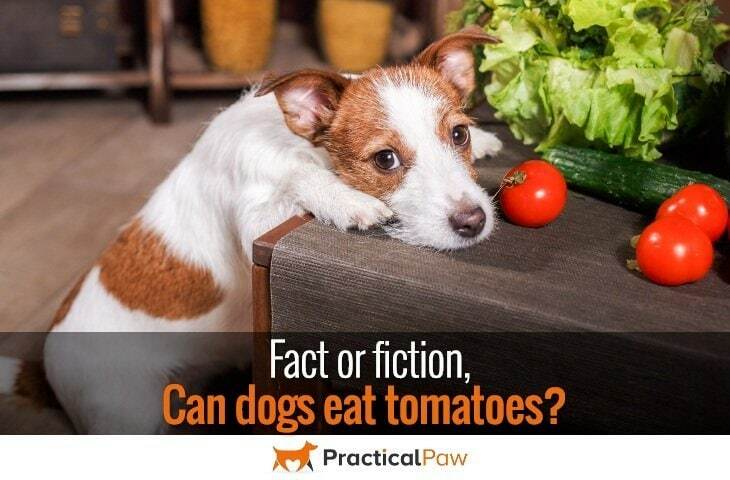 Fact or fiction, can dogs eat tomatoes? They may be number one on the homegrown vegetable plot, but can we share the many benefits of this versatile and health boosting fruit with our canine companions? Can dogs eat tomatoes? Tomatoes are widely known for their antioxidant properties. Since there are hundreds of varieties to choose from and they are easy to grow, it’s no surprise that they are a popular choice for the home vegetable garden. Despite being used primarily as a vegetable, the tomato is a berry and therefore a fruit. It belongs to the nightshade or Solanaceae family of plants that include potatoes, peppers, and aubergine (eggplant). Tomatoes are a good source of vitamin C, potassium, and folate. They are also one of the major sources of the antioxidant lycopene which has been linked to the reduced risk of cancer and heart disease. With so much going for it, it’s no wonder we want to share the benefits of tomatoes with our dogs. However, it’s also worth considering the risks of giving our dogs food that under normal circumstances they wouldn’t eat. The nightshade family of plants has a reputation for being toxic. This status is well deserved as many of them do contain dangerous toxins including tomatoes. The tomato contains two main alkaloid toxins, solanine, and alpha-tomatine. These toxins are primarily concentrated in the stems, leaves and unripe fruit but can be found throughout the plant and act as natural defense mechanisms against pests and disease. What’s more, tomatoes have a pungent smell that is off-putting. They also have prickly hairs also cover the leaves and stem making them unpalatable to most animals. However, you should still be cautious if you grow them at home and never leave your dog unsupervised with unrestricted access to the plants. In reality, it would be rare for your dog to experience problems from eating tomato plants as the amount that they would need to ingest is quite large. However, despite the small risk, you should keep an eye out for any signs of ill health if you suspect that your dog has ingested any tomato plants. The good news is that ripe tomatoes can be given to your dog in moderation as they contain very little toxin. 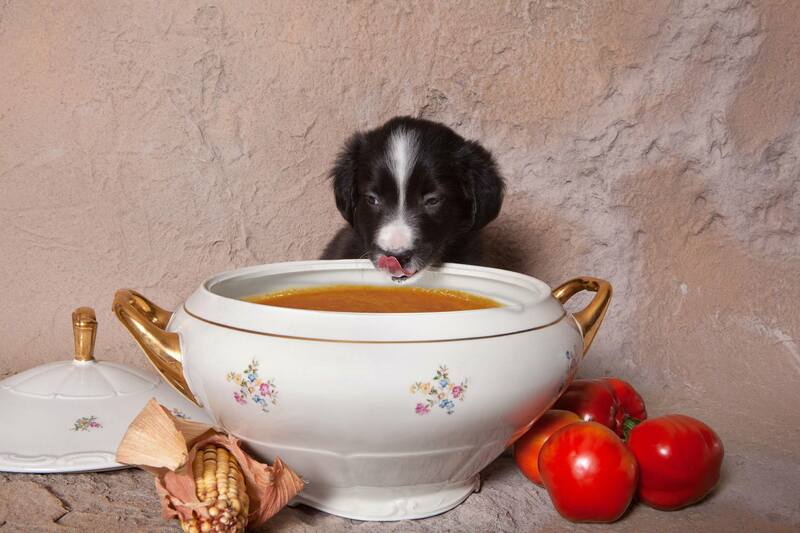 As with any food that you haven’t given to your dog before, try a small piece first. Monitor for any side effects before increasing the amount or frequency that you give it to your dog. Cooked tomatoes are also safe as long as other foods that are unsuitable for your dog like onions are not present. Can dogs eat tomatoes? Yes, feeding your dog ripe tomatoes in moderation is safe. The nutritional benefits are huge, and the risk of your dog experiencing any issues are small. Of course, if you do have a dog that will eat anything and a prickly leaf won’t deter them. Make sure that you supervise your canine companion in any vegetable plot as tomatoes aren’t the only plant that has a toxic defense system. If you want to give your dog a special treat, then why not try one of these fantastic recipes from the Doggy desert chef and Dog treat kitchen. Preheat oven to 350 degrees Fahrenheit and line a baking sheet with parchment paper or a silicone baking mat. In a large bowl mix all ingredients stirring well. Knead dough into ball and roll onto a floured surface 1/4 inch thick and cut with the cookie cutter of your choice. Use a fork poke holes in the tops of the biscuits to prevent then from puffing up. Place on your prepared cookie sheet and bake for 10 minutes. Cool and refrigerate. Makes 3 to 4 dozen Biscuits. In a large bowl, whisk together the wheat flour, dried basil and oregano. Make a well in the dry mixture and pour in the milk mixture.Stir together until combined. Knead the dough into a ball. Use more flour if needed to reduce the stickiness. Roll out to 1/4 to 1/2 inch thickness. Using a 2 inch biscuit cutter, cut into circles. Place the unbaked pizza crusts on the baking sheet. Top your pizzas with the desired toppings. Bake for 15 to 20 minutes or until the cheese begins to brown. Cool completely on a wire rack before serving. Preheat oven to 325 degrees Fahrenheit and line a baking sheet with parchment paper or a silicone baking mat. In a large bowl mix all ingredients one at a time, kneading well after each addition. Knead dough into several balls and roll onto a floured surface 1/2 inch thick. Dough is very thick and a little difficult to roll. Cut with the cookie cutter of your choice. Place on your prepared cookie sheet and bake for 15 to 20 minutes. Cool and refrigerate. Makes 2 to 3 dozen rounds.